It is winter, meaning snowflake season. 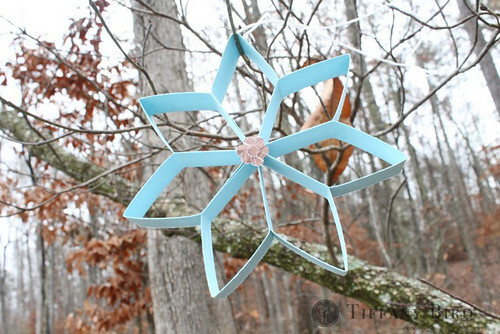 I designed three simple paper snowflakes you can use as decorations, tree ornaments or just something to get you in the mood for snow. I am not a snow person myself, however, I do like decorative snowflakes. 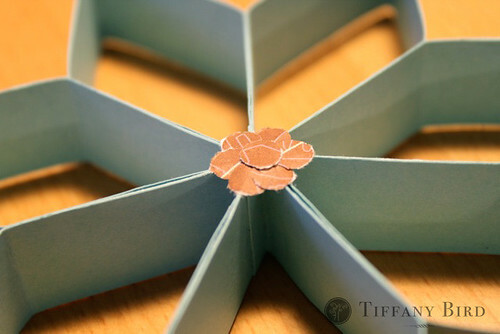 I made these snowflakes with single colored cardstock. Next time, I’m planning on using designed double sided cardstock. I am doing each snowflake tutorial separately to prevent extra long posts. 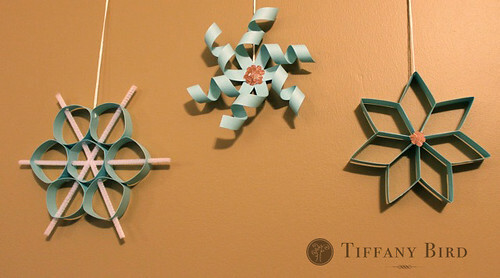 Here’s the piping paper snowflake tutorial, the twirly snowflake and then a surprise forth snowflake, the twisted paper snowflake. 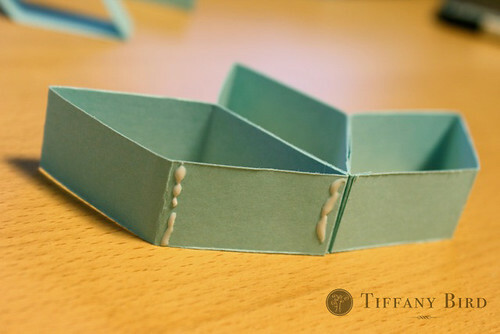 If you make something using this tutorial, please upload pictures of it in our Flickr group to show it off to everyone. You may be featured on Simply Modern Mom. 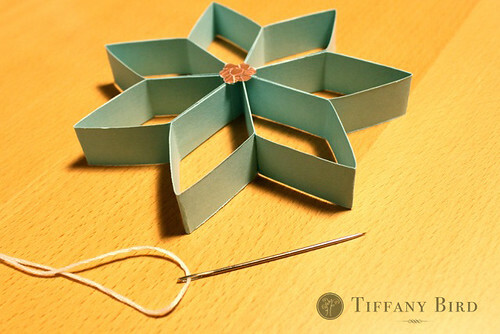 Measurements and sizes are according to the snowflakes I made for this tutorial. You can adjust to make snowflake bigger, smaller or fuller. 2. 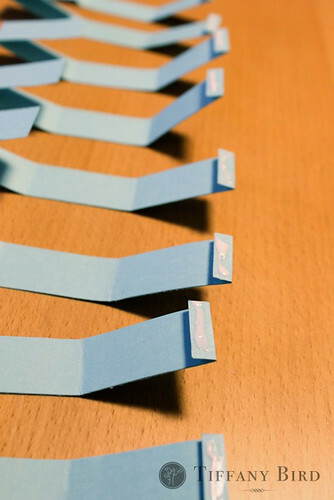 Fold one end of the strips at 1/4″. Do to all the strips. 3. 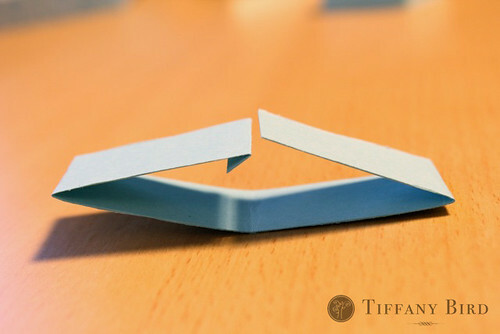 Keeping the 1/4″ folded, fold the strip in half. 4. 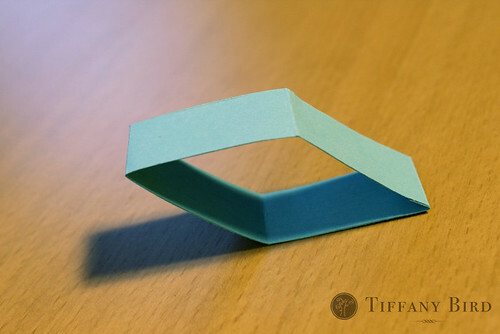 Open the half and fold in the two ends, with the 1/4″ still folded, into the center. 5. 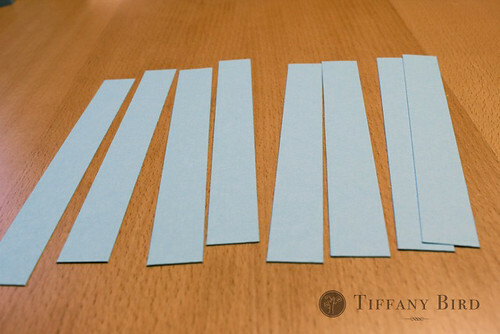 Apply glue to the 1/4″ portion of the strip and glue the other end to it. It should be diamond shaped. 6. 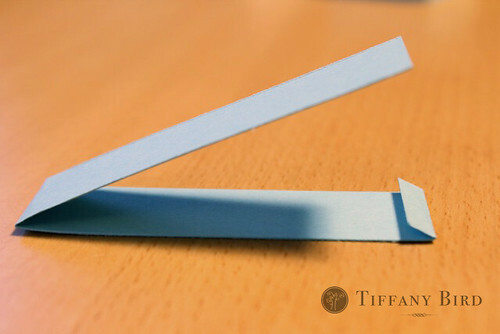 On the outside of the diamond, apply glue to the center point and to the left point of the strip. Then attach a second diamond strip to that. Continue until all diamonds are glued together at the center and the touching points. 7. 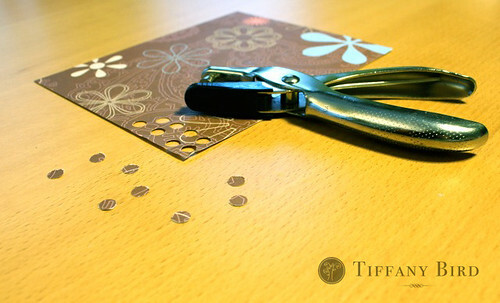 Hole punch a different colored paper and glue the punched circles to the center. Or add other types of embellishments. Very Cute!! I am going to have to try some for my tree. Those are amazing! I love them! Thanks for sharing this tutorial! Wow, I’ll definitely have to try these. So simple and so cute! These are so very cute AND simple–that’s what I like!! Great photographs too! They are BeAuTiFuL! I’m soooo gonna make some of these! Bre will love it! Those are the cutest snowflakes I have ever seen! Thanks for linking this to my blog! Thanks for all your comments! I hope to see pictures of your snowflakes if you make some. I found some of these in an old Martha Stewart book , made a few and really liked them. Your’s are fantastic…..now I want to make some more! Great blog! AWESOME TUTORIAL! THose are so sweet! Simple and seasonal. Love the idea and a BIG THANK YOU for the tutorial. Those visual aids help so much. Wow….it looks so perfect in the barren tree. These are great, thanks for the tutorial – I’ll give these a try for sure. Snowflakes are so fascinating with their patterns. I am a snow person, as long as I’m at home with my slippers and a cup of hot chocolate. I love the way everything goes so peaceful and quite when it snows. If I’ve got somewhere to drive that’s another matter! Wonderful project to work on with the family. It would be fun to embellish them too! Wow, how creative! Those look great! Oh these are GREAT ! Thank you for the tutorial. A really fun project. Thanks for sharing and have a GRAND weeken. Very cute! I couldn’t use them utside due to all the heavy rain, sleet and snow here but, hanging inside my windows would be perfect! Thanks! 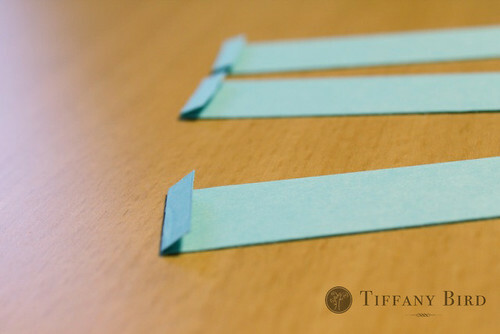 Sometimes the simplest projects are the sweetest! We are heading to the grandkids this next week. I have a project for an afternoon. Thank you !